The NASA SPHERES satellite drifts like a puck on an air hockey table, spinning slowly as its canisters release puffs of CO2 to steady its course. A Google Project Tango phone, which acts as the satellite’s eyes and brain, displays a heat map view of its surroundings. 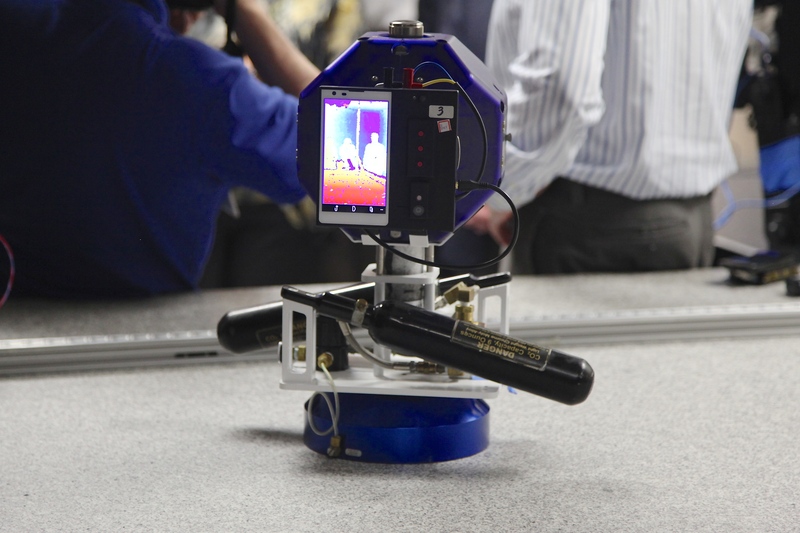 A NASA SPHERES robot equipped with a Google Project Tango phone displays a heat map of the people it sees. Photo by Signe Brewster. Its world is limited: a 6x6x6 foot cube that sits atop an almost perfectly level granite table so large a building in the NASA Ames Research Center campus had to be built around it. At a demonstration for NASA administrator Charles Bolden Tuesday, Smart SPHERES software development lead Zachary Marotto explained that’s because SPHERES used to rely on sound-emitting beacons attached to the walls of the cube to triangulate its location; microphones that pockmark the satellite’s surface would listen to pinpoint its exact positioning. But now the SPHERES’ Nexus S phone brain has been replaced with a Tango, and the walls are coming down. Tango phones sense the world in three dimensions. They don’t need beacons to help guide them. They rely on infrared instead of GPS to map out nearby obstacles. The three SPHERES on the International Space Station will be upgraded with Tango phones later this year, which could soon allow them to move beyond their 6x6x6 foot pen on the ISS. Smart SPHERES project manager Chris Provencher explained that SPHERES satellites are not the final goal for the technology; they were just a hardware option that already existed when his group embarked on the project. They are working on pairing the software with the Robonaut humanoid robot too. 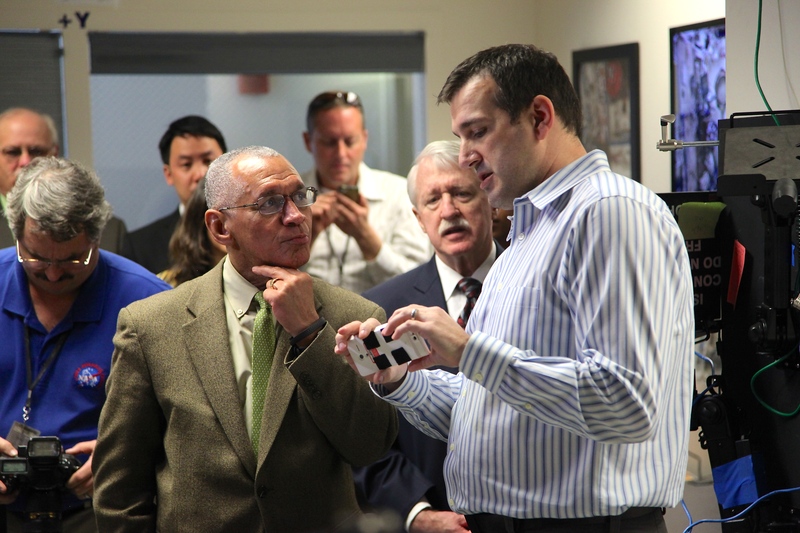 Smart SPHERES project manager Chris Provencher demonstrates a Google Project Tango phone for NASA administrator Charles Bolden. Photo by Signe Brewster. The main goal is to create robots that can assist and participate in human exploration missions, like a visit to an asteroid or Mars. But for now, Tango-equipped SPHERES can help out on the ISS by conducting visual inspections and other simple tasks. The ISS crew and Lockheed Martin recently demonstrated that that they could collaborate on controlling the robots, which can be autonomous or operated manually, from space and the ground. The Tango phones used by SPHERES are very similar to the devices Google shipped to developers this month and will possibly sell to consumers in the near future. They’re “space grade,” which just means that the phone is split into two, with both its front and backside facing away from the robot. Marotto explained that the team decided to pair mobile phones with SPHERES because they already contained tools like Wi-Fi compatibility and imaging, and it would be easier and cheaper than developing totally new technology. Smart SPHERES software development lead Zachary Moratto demonstrates how wide the camera on a Project Tango phone can see. Photo by Signe Brewster. Bolden later affirmed this by saying that private businesses now do some tasks better than NASA, and the agency will recognize that more and more by outsourcing jobs that were traditionally done in-house to focus on human exploration. The most visible example is the short ISS resupply missions that NASA has turned over to SpaceX and Orbital Sciences.